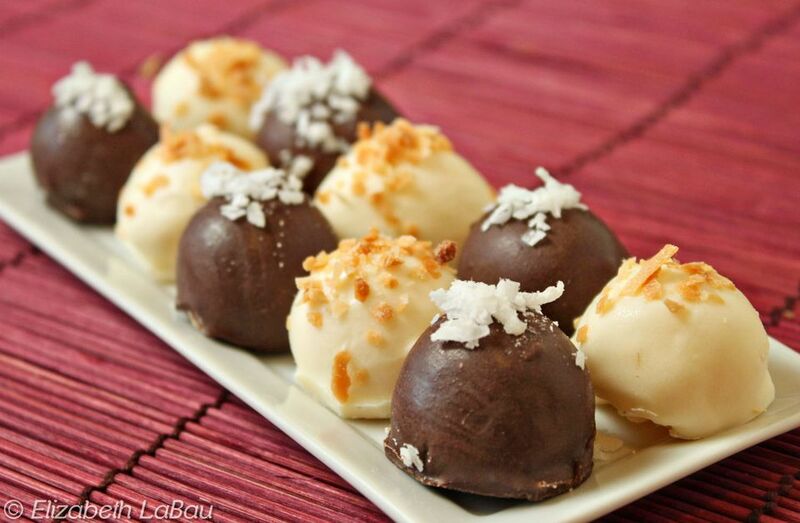 Coconut Truffles blend the mellow sweetness of white chocolate with the tropical flavor of shredded coconut for a delicate, rich truffle that’s perfect dipped in milk or white chocolate. Place the cream and the coconut in a small saucepan over medium-high heat, and bring the cream to a simmer. Take the pan off the heat, cover it with a tight-fitting lid, and let it sit for 30 minutes to infuse the cream with coconut flavor. After 30 minutes, place the white chocolate in a medium microwave-safe bowl and microwave it until melted, stirring after every 30 seconds to prevent overheating. Place the cream back on the heat and bring it to a simmer again. Once hot, pour the cream over the melted white chocolate, and whisk them together until smooth and incorporated. Add the room temperature butter and the coconut extract and whisk until the butter is incorporated and the ganache is smooth. Press a layer of cling wrap on top of the ganache and refrigerate it until it is firm enough to scoop and roll, about 1-2 hours. Pour the powdered sugar in a shallow bowl, and dust your hands lightly with the sugar. Use a spoon or a small candy scoop to form small balls from the ganache, roll them between your hands to get them round, and place them on a foil-lined tray. To finish the truffles, melt your white or milk chocolate candy coating in the microwave until it is smooth and fluid. Using forks or dipping tools, dip a truffle until it is completely submerged in the melted coating, then bring it up out of the coating and tap the fork against the lip of the bowl to remove excess. Place the truffle on a foil-covered baking sheet, and while it is still wet, sprinkle the top with toasted or untoasted coconut. Repeat until all the truffles have been dipped. Place the tray in the refrigerator to set the coating for about 15 minutes. Chocolate Coconut Truffles can be stored in an airtight container in the refrigerator for 2 weeks, and are best served at room temperature.